Regulatory filings in electronic CTD have become the mandatory or preferred method for many regulatory agencies. AXSource Consulting offers regulatory submission compilation and filing in the electronic Comment Technical Document (eCTD) and Non-eCTD electronic Submissions (NeeS) formats. Our regulatory experts will prepare, publish, validate and review your submissions for more cost-effective filings. 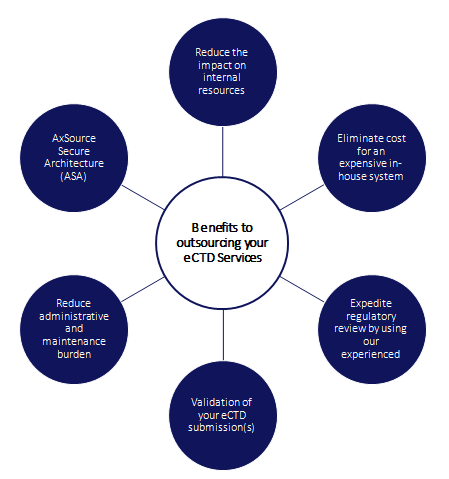 With the added benefit of having our on-site IT company and our own ASA (AXSource Secure Architecture), AXSource is more than ready to support all your eCTD outsourcing needs. We fully support the preparation, conversion, and compilation of your documentation for conformance to regulatory agency requirements (i.e. FDA, Health Canada, TGA, etc.). Gateway Submissions: FDA Electronic Submission Gateway (ESG), Health Canada’s Common Electronic Submission Gateway (CESG), etc. Query Management to support clients. Where necessary, supplementary support for paper, documentation, compact disk and/or USB devices is accommodated. Health Canada electronic CTD: NDS, SNDS, ANDS and SANDS; Non-electronic CTD electronic-only: Medical Device and Veterinary Drug regulatory activities. FDA eCTD: NDA, BLA, ANDA, CTA, DMF and IND. European EMA eCTD: Original, Variations, MAA-CP, DCP, MRP, CTA, DMF etc. TGA (Australia Government): Registration Applications, Master files, PSURs etc. NeeS Supporting clients with preparation & review of Non-eCTD electronic submissions. Device, NHP & Cosmetic e-Filings Medical Device submission (FDA eSubmitter), NNHPD submissions (Trading Partner) and Cosmetics registrations are supported. If you are a Regulatory Affairs contractor or independent consultant, please contact AXSource to fully support your Electronic publishing needs. Request a meeting today by contacting Sales at info@axsource.ca.